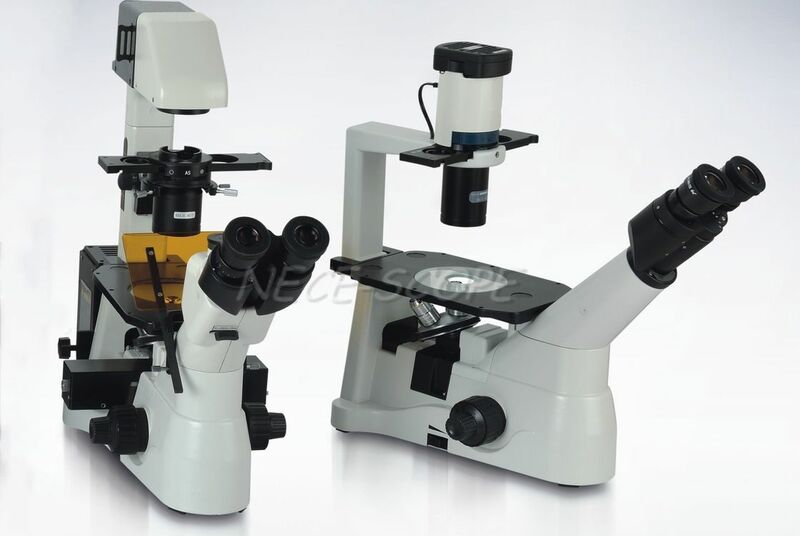 NCF-S600 laboratory inverted fluorescence microscope, designed for cell culture observation, to get details of cell growing process, internal spontaneous fluorescence phenomenon, living cell fluorescence transfection, protein transfer and etc. New generation of infinity color corrected optical systems and professional plan semi-apochromatic fluorescence objectives, present you sharp and br- ight fluorescence image. Professional fluorescence filter system, imported optical material and broa- dband multilayer coating, high transmissivity, mould proof, heat insulation a- nd safety protection system, OSRAM brand mercury lam digital power-supply control. Swallow tail slide switch easy to change filter cubes, three paths for fluores- cence and one for bright field, four filter cubes can be mounted. Scientific research class cold CCD, high resolution, fast transmission. Intell- igence Chinese fluorescence image processing software, meets any requ- est of the most professional picture processing. 6V/30W transmission illuminator, various performances, bright-field, dark-fi- led, phase contrast, polarization observations. Stage and accessories 160x250mm platform; Mechanical stage, move range 120x78mm; Extension plate; Glass stage; Metal stage with slot; Terasaki holder; Holder for φ35mm Tissue culture vessel. Microscope body Coaxial focus system, coarse focus distance 25mm, fine focus precision 0.002mm, with degree of tightness adjustment, built-in 90-240V wide voltage transformer. U-LH100HG mercury lamp house, center and focus adjustable. With mirror, center and focus adjustable. 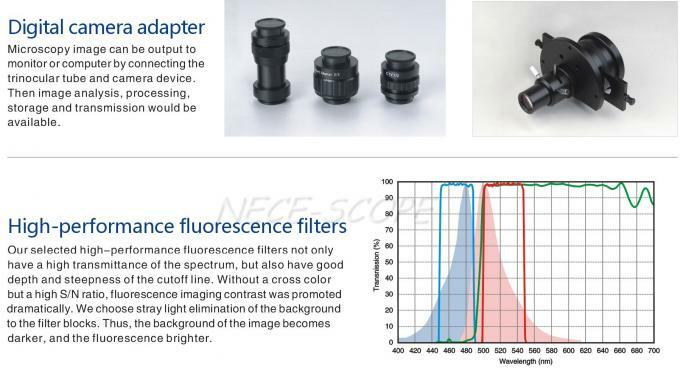 Fluorescence filter Fluorescence filters, standard UV,V,B,G four cubes, can custom-made.